THE MAGIC IS BACK AGAIN. Fasten your seat belts as those unbeatable Detectives Riggs (Mel Gibson) and Murtaugh (Danny Glover) take on another joy ride of exhilarating mayhem in the name of law and order! Unwittingly (and unwillingly) reunited with their former sidekick Leo Getz (Joe Pesci), the two battle-scarred cops find themselves on the trail of a stockpile of illegal firearms stolen from police lockup. At the same time, they are forced to pit their wits against tough Internal Affairs Detective Lorna Cole (Rene Russo) who gives Riggs more than a run for his money, both on the job and after hours! Danger, romance, humour and non-stop action . . .the magic is definitely back! 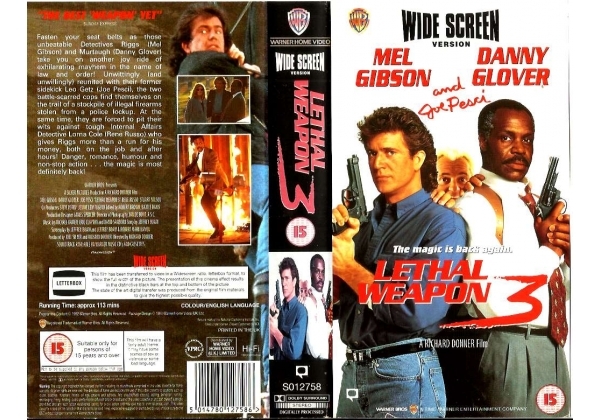 Or find "Lethal Weapon 3 (widescreen)" on VHS and DVD / BluRay at Amazon.